Hi Nicole, Before I tell you how I came upon your story of Alec, I know it has been two years since you lost Alec, but I still wanted to say I am so sorry for your loss and what you and Alec had to go through. 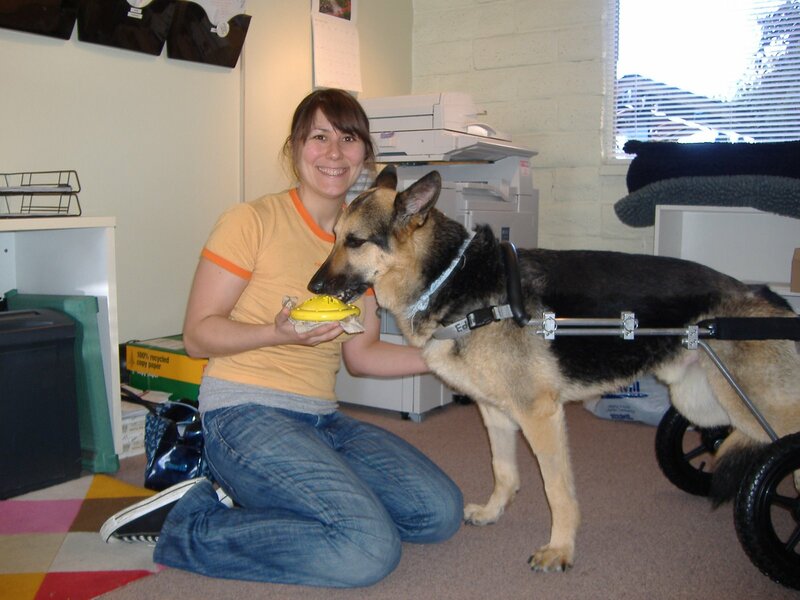 I came upon your site after searching on the terms “Eddies Wheels” and “cannot urinate.” I have a 110-pound German shepherd who became paralyzed as the result of a disc operation and I ordered a wheel chair from EddiesWheels. I was not informed of the inability to urinate problem “some” dogs have with Eddies wheelchairs. After I told Leslie of the problem (Leben, my dog, can urinate on his own when in a harness), she wrote back “There is a small percentage of male dogs who have problems urinating in our carts. It has to do with your dog’s plumbing – so the first thing is to check the height at the rear. Is Leben using the stirrups? If he’s not, try lowering the cart slightly and see if he can stand slightly above the saddle to urinate. We’ve also sent saddle shims to these male dogs to lift them slightly off the center of the saddle and that usually works.” Nice to know this now. Their web site should say this, but does not. Our stories sound similar. For reasons you wrote about Alec, it is so critical I find a solution to this that I drove out to Dr Parks, the inventor of the canine wheelchair, and he is making another cart for Leben, which I will pick up tomorrow. By the way, my pevious German sheperd, Sonntag, had a cart from K9 Karts and he was able to urinate from it. Dr Parks told me he gets a lot of customers who bought carts from Eddies Wheels who come to him for help. By the way, are you the Nicole from the ADLF who was involved in the Ringling elephant trial in DC? I attend the entire trial as an observor. Eddie’s Wheels did work with me to design to wheelchair that allowed Leben to urinate from it, and it worked quite well.